Ever used a dodgy builder? Then thank your lucky stars you’re not a granny cyclone victim in Bangladesh, with people from the government arriving to help. The money to build her a new house is provided by a climate-adaptation fund, but all she gets is a roof and floor but no walls. The structure then begins collapsing within two months. The Paris climate talks next month are partly about creating a $US100b-a-year climate fund to help the Third World adjust to hypothesized global warming. In a bit of political theatre (we taxpayers bought her tickets), Foreign Affairs Minister Julie Bishop last December pledged $200m to this fund, rhapsodizing about “investment, infrastructure, energy, forestry and emissions reductions.” [i] The Climate Fund is now taking heat for corruption and non-transparency. Newsweek, although a fervently warmist journal, ran a piece to that effect a few days ago. The government-funded plan was to build cyclone-resistant housing at Khulna for an abjectly poor community devastated by Cyclone Aila. 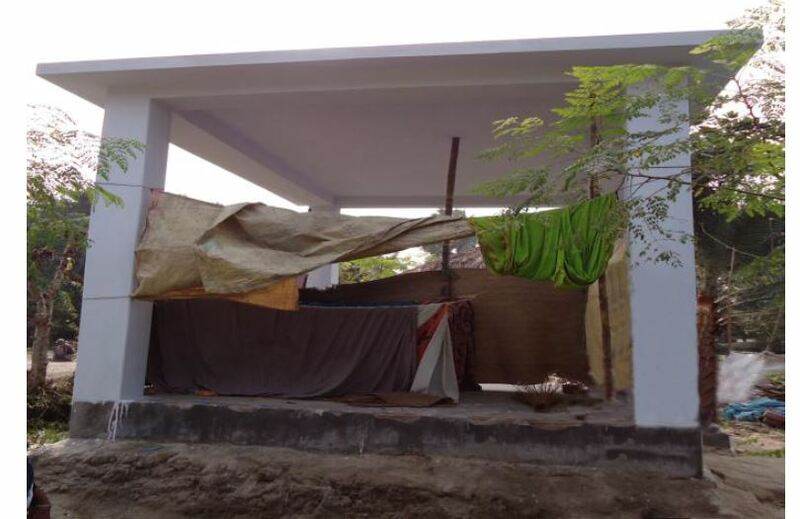 The photo shows what was actually built for grandmother Mrs Khadija Begum — a 4metre x 5metre house with no walls. “I don’t know whether it is built for a human being or not. There are only four pillars with roof and there is no sidewall in this house. So I do not know how my family can live in this house”. The auditors noted she has a granddaughter “and it is depressing for her as she is living in cold, and the house is not suitable for any other seasons like rains, storms and floods.” The “house” is pictured below. Mrs Begum was aware that the government budget for each shelter house was US$1400. But the builders substituted cheap materials and ,within two months, the house was collapsing. Worse, it was now taking up some of her little plot, making that land useless. Other locals have begun using it as a cow-shed. Actually, the budget for the house was supposed to be $US3100 and the original plans included “both roof and walls”. But the government agency cut costs by dispensing with walls. That way it could build more (wall-less) houses and publish fancier statistics in its annual report. There were no feasibility studies, and the funders “had no knowledge” about how to design cyclone-resistant housing. Transparency International notes that the families had already been pauperized by natural disasters and had no spare money for building walls. Taking a step back, who decided who would get the (useless) houses? Well, a large committee of stakeholders compiled the beneficiary list — but it was then it was re-written by political insiders. One hopes, but cannot be confident, that no baksheesh was passed quietly under the table. The main contractor let out the work to subbies for quick progress, but the subbies were accountable to no one about their materials, schedules and quality inspection. Unsurprisingly, their workmanship was ‘very poor’ and was followed by disintegration of plaster-work and collapsing roofs and basements. “The houses have now become a burden for their owners,” Transparency International says. This wasn’t an isolated instance of climate-fund crazy constructions. The next project audited involved a Char-Mynka district dam and land reclamation, with total funding of $A9m. The contractors quickly ran through about $3.5m in spending, “but there was no significant progress in the project”. Oversight of the money disappeared in the cracks between the local and district authorities. A third project was Forest Department tree planting on coastal embankments, with a budget of about $A2m. Some of the assigned land had been leased away by other officials and used by shrimp farmers; some land was occupied by squatters and other communities; and some land was useless. The forest officials lost interest because they had no funds to actually visit the site. Capacity building and institutional strengthening for climate funding”. The Bangladesh government injected $US300m into its climate trust, with two-thirds for projects, and the rest “supposed to be used” for emergency response and collaboration with non-government organisations (NGOs). The audit’s wording suggests skepticism, borne out when disbursements to NGOs were stopped because of corrupt selection processes and “huge criticisms and protests by the media”. The number of central government officials – a mere five or six — monitoring 63 projects nationally worth $US150m would fit in a telephone booth. The other Bangladesh trust is funded by altruistic Western governments and agencies. This fund saw an outflow of $US125m in spending, but only three projects started, with spending of $US38m. Allegations of “irregularities and possible corruption” caused the government to vary the projection selection methods, creating new allegations of conflicts of interest. Transparency International could find documentation for only one of the projects, while the other two had nothing available for inspection, other than their names and amount of money approved. The World Bank, supposed to help with project selection and planning, deducted 4% of the funds for “fiduciary management and operating costs”. Transparency International asked the World Bank for details about the projects and received no reply, rendering it unable to assess the governance risks. according to reliable sources, some projects have been approved … for funding without prior justification and applicability of climate change criteria; rather, they were chosen under political considerations. Meanwhile, Newsweek on November 8 ran a piece by Ben Wolford with a realistic heading about the Paris-planned $US100b Green Climate Fund. It read, Green Climate Fund Must Fight Corruption Before It Can Beat Global Warming. The fund has garnered only (only??) $US10b so far of its intended $US100b per year, “and has been accused of promoting corruption”, Wolford says. So far, leaders of the fund have talked about its commitment to transparency while remaining opaque in practice. The board has weighed major decisions behind closed doors and, in a draft version of its information disclosure policy, even suggested that tape recording certain meetings should not be allowed. Also bear in mind that Prime Minister Malcolm Turnbull has decided to go to the Paris talks. Asked if he would “go beyond” Australia’s current commitments, he said: “Sure, arguably. That depends on the rest of the world.” Gee Malcolm, add another zero to our Climate Fund contribution. It would still only be $2b were you to do that, and and the world’s poor clearly need many more wall-less, ramshackle hovels. As Siebert puts it, “It’s better than doing nothing at all”. [i] The coalition government had previously declined to contribute to the fund, but then-Prime Minister Tony Abbott changed his mind. [ii] Our own Ewan McDonald, deputy secretary of DFAT, is on the board. Others include reps from corruption-free Congo, Egypt, South Africa, Cuba and Zambia. Surely they are “sound bites”, whether telegenic or not? Having to be telegenic is the whole point of a sound bite. Indeed it is, but the author wrote “telegenic sound bytes”. Like building unions in Oz kleptomania is in the NGO DNA. In 2003 I sponsored a well-educated, well-meaning an dreamy-eyed Asian girl to attend a course at an Oz University. She wanted to return to her homeland and begin proselytising her kumbayah among the poor. On her return she accepted a low-paid job with an NGO and began helping the poor with the few funds remaining after corporate, travel and administrative expenses had been covered. Time passed, she married, had children and now found that idealism and low pay no longer cut it. She joined the UN, so now she is well paid and is buying a house, has a car and occasionally attends international conferences at 5-star hotels on such subjects as ‘Alleviating poverty in the Third World”. She has been able to afford to visit me in Oz. ‘Kumbayah’? She winces at the memory as she retains a conscience, but as Harry Chapin sang “there are planes to catch and bills to pay” and thank god for the endless poor otherwise the gravy train would stop and that would never do as I would no longer feel guilty when I say ‘No’ to the can-rattlers at traffic lights or throw the unopened begging letters in the bin.